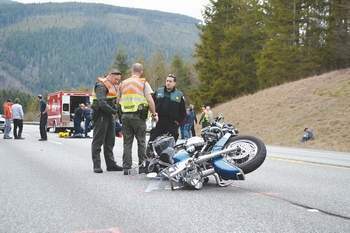 A man was killed and his female passenger was seriously injured when their motorcycle apparently ran into a large bird Monday afternoon near Chimacum on the Olympic Peninsula, according to Jefferson County officials. The accident happened in a rural area, near the intersection of Center Road and Eaglemount Road. East Jefferson County Fire and Rescue performed CPR on the man, but he died at the scene. The woman was taken by helicopter to Harborview Medical Center in Seattle. The large scavenger bird was euthanized by authorities, Fire and Rescue said. The species of the bird is uncertain, according to authorities, and it hasn’t been determined whether the bird was in the air or on the road at the time of the collision. An “act of God” in legal terms means an inevitable accident that cannot be prevented by human actions or planning. Oftentimes the “act of God/Nature” defense is used in relation to a heart attack or stroke behind the wheel, but it can apply to unforeseen, fluke accidents on the road as well. No one can be held responsible for an actual “act of God,” but if the injury that occurred could have been prevented by normal care, then somebody could be held liable. The “act of God” defense will likely fail if the risk was preventable. For example, if the driver of the motorcycle was speeding, not taking the proper safety precautions or was aware of the risk of the animal in the area, he could be held responsible. 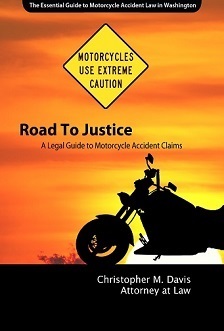 After an accident, a motorcycle accident injury case proceeds just like a car accident claim. The passenger would file a claim against the driver’s insurance. As in any personal injury case, the person bringing the claim must be able to prove two things to win the case: liability (who was at fault) and damages (how badly the plaintiff was injured). If the motorcyclist was negligent, it is likely a personal injury settlement will be reached. In most cases, motorcycle or car owners operate with comprehensive coverage, meaning they’re protected if they hit a bird/deer or a tree falls on their care. They could find themselves lacking in those cases, however, if they simply have collision coverage. The passenger may also be able to file a Personal Injury Protection (PIP) or No Fault claim for medical bills and lost earnings against the motorcyclist’s insurer. If you’ve been injured in an accident that was a result of an unforeseen event, you may benefit from a consultation with an attorney with a great deal of experience in that area. Handling “act of God” claims, negotiating with insurance companies and investigation the case is complicated, but Attorney Chris Davis and the team at Davis Law Group, P.S., can help. Call (206) 727-4000 to schedule a free legal consultation.